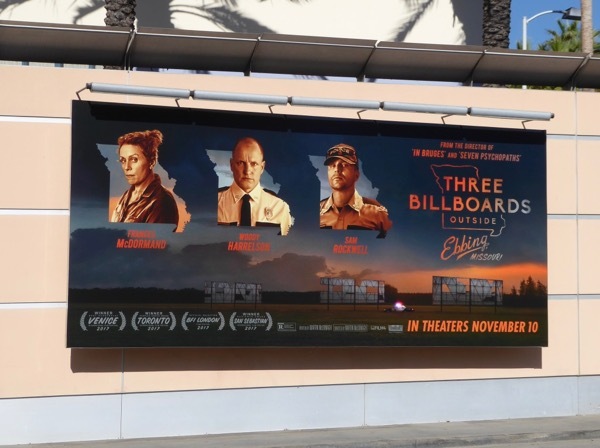 Following its success at the 75th Golden Globe Awards, Three Billboards Outside Ebbing, Missouri is even more of an Oscar favourite this Hollywood awards season. 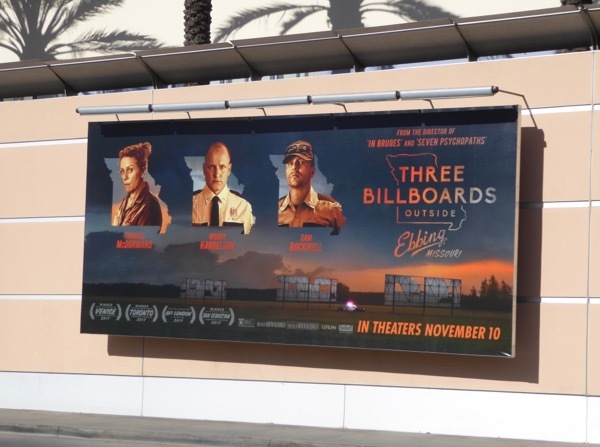 Frances McDormand won a Golden Globe for Best Actress for her role as 'Mildred', a mother who erects three billboard signs outside her town to challenge local authorities (including Woody Harrelson's police chief and his second-in-command played by Sam Rockwell) who have failed to solve her daughter's murder and apprehend the culprit after months have passed. 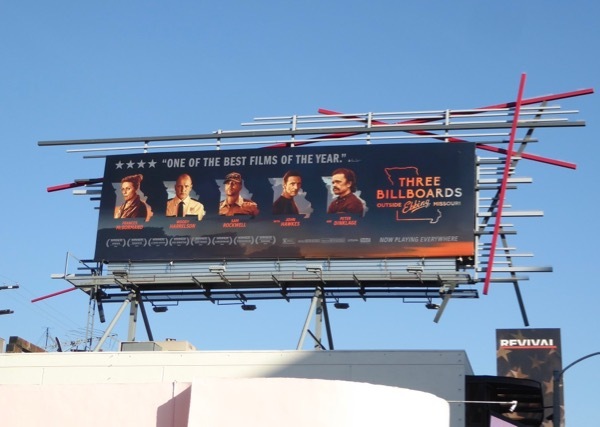 Nominated for six Golden Globes in total, the film also won for Best Motion Picture - Drama, Best Screenplay for director Martin McDonagh and Best Supporting Actor for Sam Rockwell. 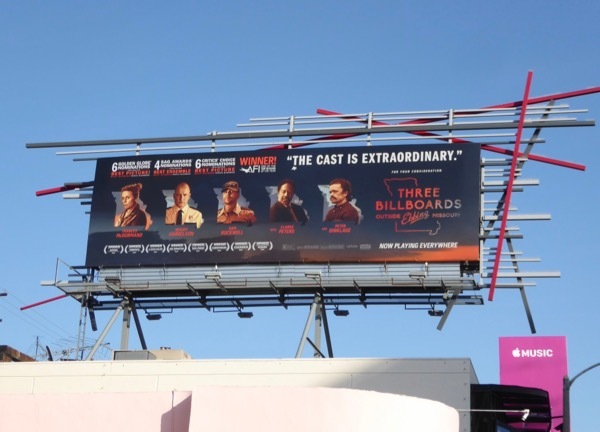 The smaller movie billboard was snapped at Fox Studios along Pico Boulevard on December 1, whist the larger 'One of the best films of the year' billboard was spotted above the Sunset Strip on December 12, 2017 and 'The cast is extraordinary' vision was spied in the same ad location on January 10, 2018. 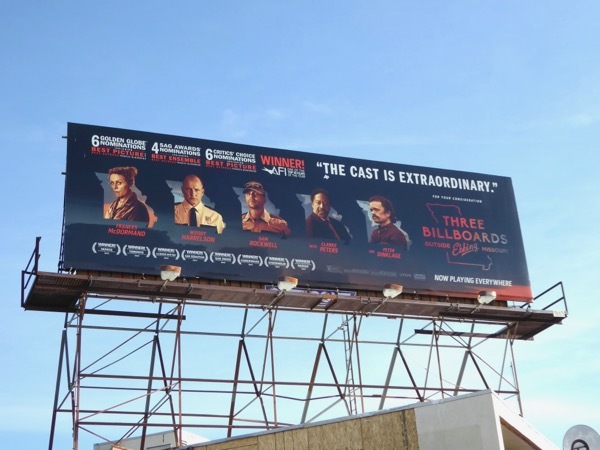 Fans of Frances McDormand can also enjoy these billboards for HBO's Olive Kitteridge mini-series, whilst admirers of Woody Harrelson can check out these True Detectives billboards and you can see more of Sam Rockwell in this movie billboard for The Way Way Back. Already nominated for nine BAFTA Awards and three Screen Actors Guild Awards, just how many Academy Awards will follow do you think? 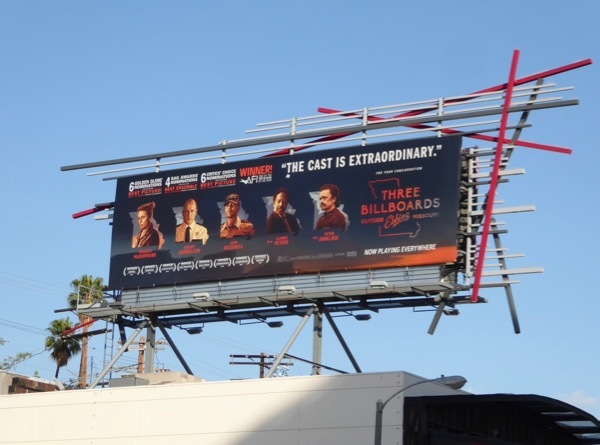 If only this movie had a bigger marketing budget, you can just imagine what fun they could have had along the streets of L.A. with the title of this film. 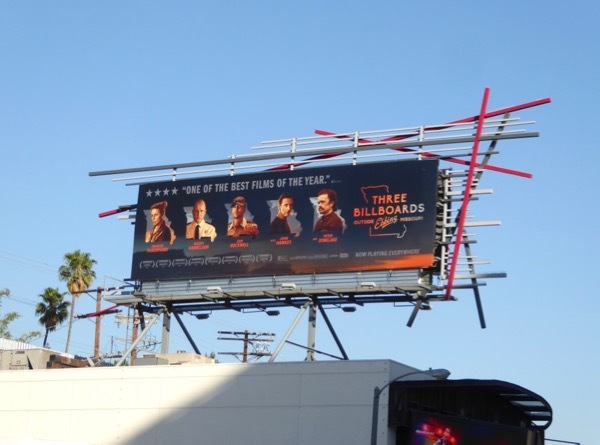 UPDATED: Here's another awards consideration billboard for the dark drama spotted along Pico Boulevard on January 15, 2018.